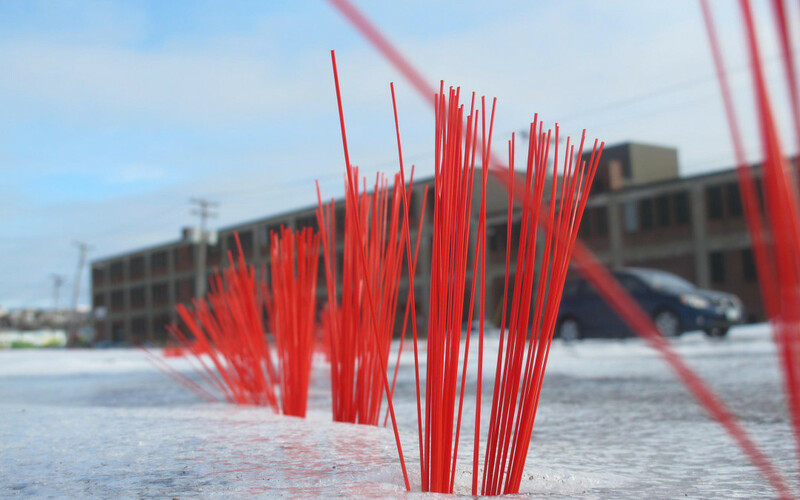 In 2014, students from the University of Maine launched an installation art project along the waterfront in Portland, Maine. The King Tides Trail is a four mile trail along the shoreline with markers indicating where a king tide would reach with 3 feet of sea level rise, the minimum expected by 2100 due to climate change. Every vertical inch of sea level rise moves the sea level 50-100 inches inland, so 3 feet of sea level rise will have a huge impact on low bank land. Some of the King Tides trail is marked with red tassels nailed into the ground; other areas with informational observation points, solar lamps, and wooden posts. The installation is part of the larger King Tides Gulf of Maine project. A cycling and walking trail, along with a Google map showing the path, is open for visitors interested in sea level rise. This project is an example of how we can make climate change real for people. By showing where the water will be, not that many years from now, perhaps we can spur people to take action. On Bainbridge, we have several areas that are particularly vulnerable to sea level rise. How might we raise awareness about this issue with art in these areas?